We’ve been working on Observatory for over a year now, and hoo-boy, this project has got a very long mid-section. To alleviate the dreariness of the mid-project doldrums, we’re making a quick side-project. We’re only a few days in, but I think there’s already some amount of fun/cute/derpy stuff to see. 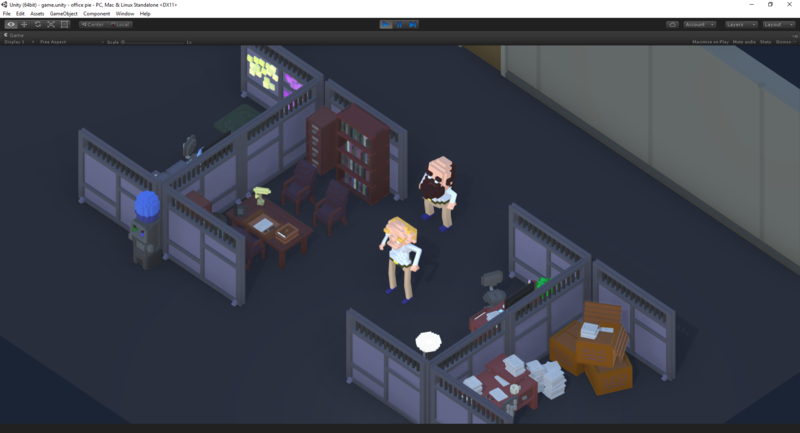 It’s called Office Pie, and it’s an game set in a corporate workspace. “Office pie” is the kind of pie that you eat in an office. Don’t worry; you won’t actually do much work here. You will have a checklist, though. A playthrough will probably take about 20-30 minutes to complete, once it’s all finished. It’s been super fun to work with voxel art so far – it’s insanely fast to produce assets compared to a “full-on” modeling process. 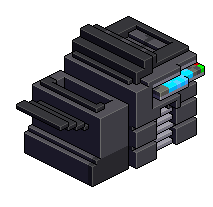 We’ve been using MagicaVoxel, which isn’t perfect (particularly, it’s missing a “drag selection” feature), but it’s free and has worked very comfortably for me so far. 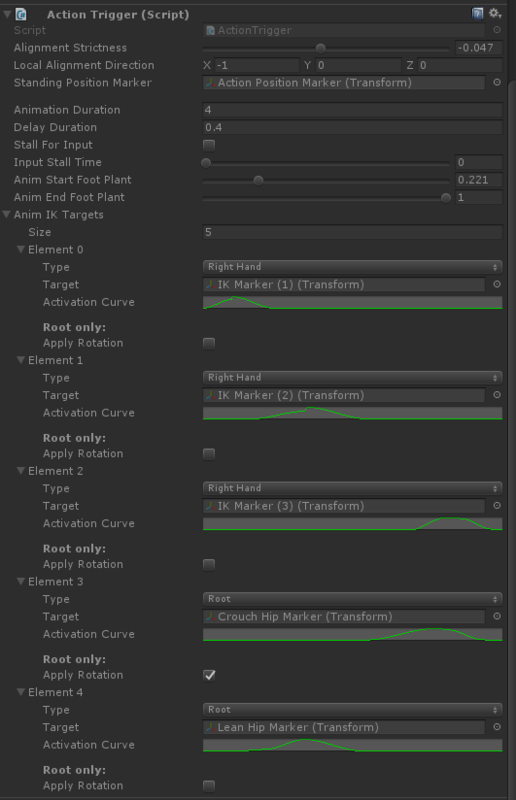 Plus it has this goofy button for exporting isometric pixel art from your voxels…which is kind of hilarious, but could maybe serve as a base for a pixel artist to add detail to? If a pixel artist was good at their art, maybe it’d be faster for them to just do it in 2D the first time. I dunno. Whatever. It has an automagic pixel-art button, and that makes me laugh. It’s tough to talk about the plans for Office Pie without spoiling the fun, so instead we’re just going to be sharing some early builds – up until the point when we reach spoiler territory. We plan to release the game on itch.io for a few dollars, and then possibly take it to Steam later. In this first build, you’re controlling three characters with the same input. 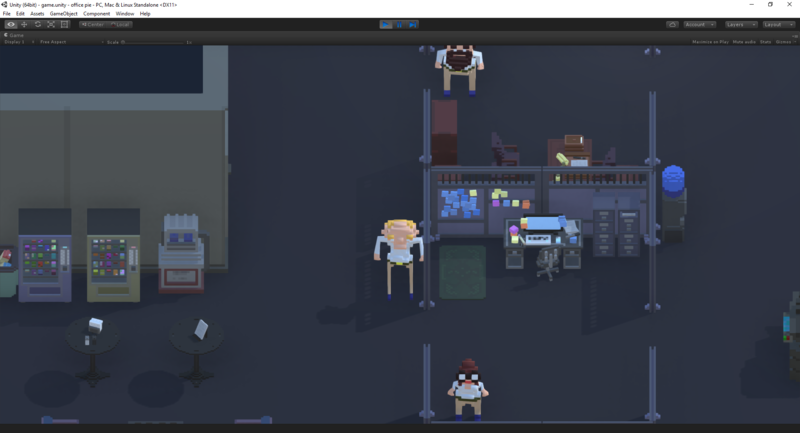 This isn’t how the actual game will work, but we’re testing some animation retargeting features with different skeletons, and I haven’t implemented any AI for NPCs yet. WASD to move, spacebar to interact (right now this only works on the couches and the two vending machines – more over time), Q+E to rotate the camera, and hold the 1 key to play a little tester “squatting” animation. Press tab to toggle slo-mo, if you want to see the character movement in detail (or if you have “Still D.R.E.” playing in another tab). There are some silly bugs if you make somebody run into somebody else while they’re interacting with an object. More news for both this and Observatory soon! We just got a connection with another headset manufacturer, so the pack is gonna be supporting a new platform in the near future.